character. It doesn't settle into that predictable rhythm of another action sequence or musical number every eight minutes. The movie has a definite sense of humor but no interest in pandering, shying away from obvious pop culture references or cheap jokes. The romance you'd normally waltz in expecting doesn't blossom according to plan. 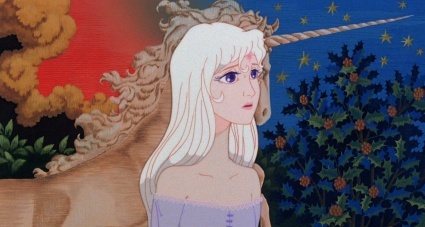 Most of the dangling plot threads are wrapped up by the time the credits roll, sure, but The Last Unicorn has the confidence to resist a stereotypically happy ending. The moral message isn't the usual "wave your freak flag...just be yourself!" that's triple-underlined in pretty much every Disney and Dreamworks movie...its central character doesn't know who or what she is, exactly. The journey to an answer spans the entire length of the film, and it ends without the nameless unicorn in the title ever arriving at a clean, neatly bundled answer. The Last Unicorn is too endlessly clever and wildly imaginative to bother settling for those sorts of stale, conventional formulas. That's why I think the film has endured so well for right at three decades now...why it continues to draw in fans of so many different ages. As much as I loved The Last Unicorn when I was growing up, I feel as if I have an even greater appreciation for it all these years later, and it's so infectious that I can't wait to grab this Blu-ray disc off the shelf and show it off to my younger relatives the next time they visit. remarkable set of actors, including Jeff Bridges as an underappreciated prince, Robert Klein, Mia Farrow, and Christopher Lee. This is a family movie in the truest sense. 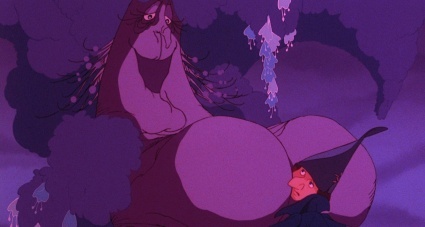 The Last Unicorn appeals to young children without talking down to them, and Beagle's dialogue sparkles with the sort of wit that certainly connects with me as an adult. There's just such...magic to this story...to this world. Its central figures are rendered with impressive depth and characterization, and again, even the "villain" of the piece doesn't truly seem like an irredeemably terrible person. The endless charm, intelligence, and artistry of The Last Unicorn have won over many hundreds of thousands of fans over the years, and it does so much, so well that its shortcomings are very easily overlooked. No, Rankin/Bass wasn't working with all that hefty a budget, and sometimes the animation does get a little choppy. The visuals certainly aren't as richly realized as Disney's glossy animated fantasies. 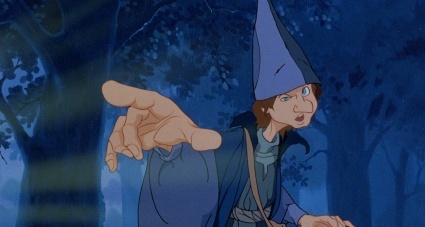 Every once in a while, it feels like entire chunks of the movie were accidentally lopped out, such as when Schmendrick suddenly starts whipping out spells in Captain Cully's camp without any setup whatsoever. I can't say I'm altogether crazy about the handful of songs written for the film by America either. For every minor gripe like that, I could point to twenty or thirty things that completely amaze me. Tacos! A cackling, booze-swilling skeleton! A cat with an eyepatch who can't gave a straight answer! Along with everything else I've gushed about so far in this review, we're talking about a movie where -- in a montage, with no dialogue -- a prince attacks a dragon and tries to impress the girl of his dreams with its severed head. 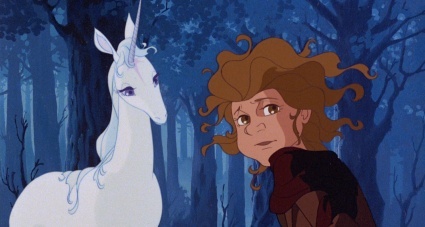 I love, love, love The Last Unicorn, and especially watching it now with older, more jaded eyes, I'm amazed a film as unconventional as this even exists. On the upside, there are clearly many other people who feel much the same way. The last couple of DVD releases of The Last Unicorn on these shores were wildly successful, apparently to the point that Lionsgate could afford to do something unexpected with this Blu-ray release. Several very noteworthy new extras were created exclusively for this high-def disc. Rather than dust off an existing master, The Last Unicorn has been retransferred, easily eclipsing every other release of the film to date. Lionsgate even found a way to satisfy parents disappointed in the very tame profanity in the movie and the lifelong fans who want the original dialogue back in place. It really does feel as if someone set out to finally make the definitive special edition of The Last Unicorn, and that passion and determination shines through. This isn't something that happens all that often, especially for a film that's being re-released exclusively on Blu-ray. To sweeten the pot even more, this disc is priced exceptionally reasonably. If you're a longtime fan of The Last Unicorn, you need to pick up this Blu-ray disc, and if you haven't seen the film before...well, this is the perfect time to correct that mistake. Very, very Highly Recommended. 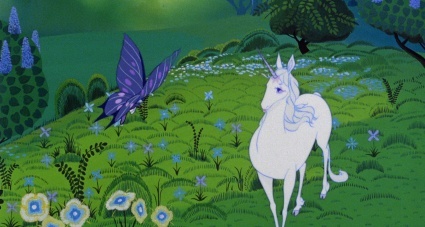 I'm going to write about how gorgeous The Last Unicorn looks on Blu-ray -- promise! -- but before I dive into that, just marvel at these screenshot comparisons from the 25th anniversary DVD and this brand new high-def presentation. ...and here's one more set. Even in these resized thumbnails, the improvement over the DVD from just a few short years ago is staggering. The difference is obviously even greater when you open them to full HD resolution. Go ahead and click! It's worth it. As vastly improved as the 25th anniversary DVD was over every home video release of The Last Unicorn up to that point, this Blu-ray disc is in another league altogether. There are no more PAL-to-NTSC hiccups, for one. Its colors are far more robust and cinematic, and the contrast between the lush palette early on with Haggard's bleak, lifeless kingdom is really heightened here. I can't get over how crisp and clear the linework is either. 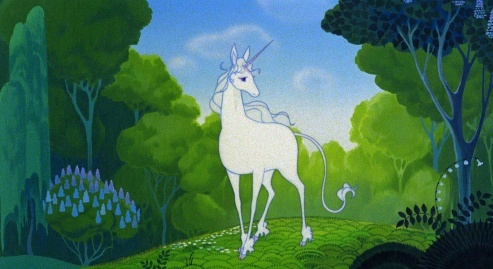 Sure, it's immediately apparent that The Last Unicorn hails from a different era of animation, but I'm still impressed. Especially given its age and very modest budget, I honestly can't fathom the film ever looking any better than this, not even when it was still making the rounds in theaters almost thirty years ago. I'm sure you can tell from the screenshots above that this new transfer exposes additional animation on all four sides of the frame as well. 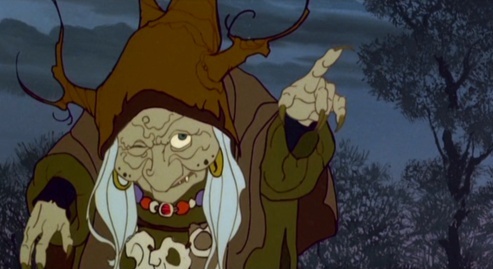 An incredible amount of care and consideration was clearly lavished on bringing The Last Unicorn to Blu-ray. There isn't any noticeable speckling or damage in the source at all. There is some cel dust, but seeing as how that's kind of baked in, I don't consider that a flaw in that same sense. 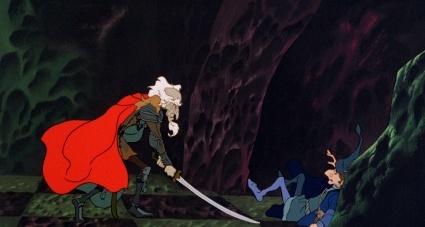 The Last Unicorn is a very, very grainy film, and admittedly, some viewers may not be used to that. Personally, I'm thrilled to see that Lionsgate shied away from digitally smoothening away every trace of grain the way some other studios have with their classic animated titles. The gritty texture comes across as character rather than a distraction, and I hope it won't turn anyone away from experiencing such a terrific film in high definition. This is just such a tremendous presentation, and I'm floored that it's been newly retransferred for Blu-ray rather than merely recycling an existing master. No matter how many copies of The Last Unicorn you may have on your shelf already, this Blu-ray disc is an essential purchase. The AVC encode for The Last Unicorn is given such a beefy bitrate that it spans both layers of this BD-50 disc. The image is faintly letterboxed to preserve its theatrical aspect ratio of 1.85:1. 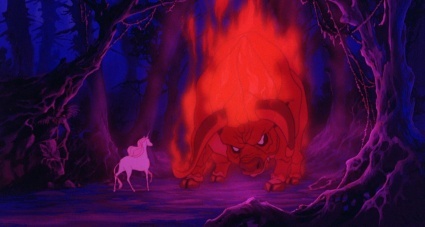 ...and, impossibly, The Last Unicorn may sound even better than it looks. There are two DTS-HD Master Audio soundtracks on this Blu-ray disc, both presented in 24-bit with 5.1 surround sound. Purists may wonder why one of them is labeled "original theatrical audio"
when it's been remixed from the original stereo to six-channel sound. There's a reason for that; Lionsgate is just being understandably coy with the labeling. When the last DVD was released, some retailers winced at the very light profanity in this PG-rated film, and a reissue was very quickly hammered out that lost those couple of barked expletives. The "25th anniversary" audio on this Blu-ray disc keeps that tiny bit of censoring in place if you're a parent who would prefer that your tykes not be exposed to that sort of thing. The "original theatrical audio" reinstates a couple of "damn"s. Otherwise, as best I can tell, the two tracks are 100% identical. This is such a perfect way to approach it. Cautious parents get what they want; ditto for longtime fans. At least as long as you can live with the concept of a stereo-to-5.1 remix, everyone walks away happy. Many kudos to Lionsgate there, and...hey! No more PAL-to-NTSC speedup either. lair, and lapping waves. Generally, the mix orients the bulk of the action up front, respecting the original stereo intentions there and letting the music more organically stretch its wings instead. There are two small downsides. It seems as if the lower-key sequences are the ones that impressed me the most with their sound design. The handful of action sequences didn't really grab me in that same way. It seems as if scenes like the Red Bull chase are mixed with a more modern approach but don't crackle with the same intensity as more recently-produced animated films. I just get a nagging feeling in scenes like that as if the soundtrack for The Last Unicorn is trying to be something it's not. I'm also a bit surprised that, given the jaw-dropping clarity and fidelity of pretty much every other element in the mix, that the songs by America sounds so much more...ordinary by comparison. They certainly don't sound bad, but they don't impress in nearly that same way. I feel guilty for even that minor sort of nitpicking. I walked in expecting The Last Unicorn to sound good, but I never hoped to hear something as outstanding as this. Again, it couldn't be clearer that this Blu-ray disc was put together by people with a deep love of the film and tremendous respect for its legions of fans, and I couldn't be happier with what they've accomplished here. There aren't any dubs of The Last Unicorn on this Blu-ray disc, but there are subtitles in English (traditional and SDH) and Spanish. The Last Unicorn is a two-disc set that also includes the 25th Anniversary DVD. Everything on that earlier release is also present on the Blu-ray disc aside from the 'Escape from the Red Bull' game. I'll lead off with what's new on Blu-ray. and there's a good bit of discussion about how The Last Unicorn changed between the early sketches of a story, the published novel, and this film adaptation. There's quite a lot about Beagle's freewheeling process as a writer, committing challenges to himself on the page without knowing how he'll be able to back out of these corners. We learn about the inspirations behind many of its characters and key moments. There are just so many great notes offered in here, such as how the Japanese animators for The Last Unicorn followed this film up with Nausicaa and would soon become the freshman class of Studio Ghibli. This commentary is a very rewarding listen and, if you only have time to tune into one, the best of the extras on the disc. Immortal Characters (13 min. ; HD): As you could probably guess by its title, the focus of this high-def featurette is primarily on the characters of The Last Unicorn and the actors whose voices helped bring them to life. It's a little disappointing that you don't hear the thoughts of most of the cast, but this is an ambitious featurette given what I'm sure is a limited production budget, and you do get to hear a phone interview with Christopher Lee. "Immortal Characters" also breezes through some of the other main talking points you'd hope to hear, such as Beagle penning the screenplay himself, everyone in the industry turning the project down except Rankin/Bass, juggling responsibilities across continents, and talking about why they think The Last Unicorn has continued to endure for so many years. 2010 The Last Unicorn Art Contest Gallery (HD): There's something about The Last Unicorn that sparks the imagination of its many, many admirers, and some of what they've been inspired to create has been included on this Blu-ray disc. The grand prize winner is an gorgeous rendering of Schmendrick surrounded by representations of the rest of the cast. There are slews of other categories, and the entries run the gamut: tattoos, a unicorn handbag, a unicorn photo snapped on the beach, cosplay, sculptures, and even a bedroom redecorated completely around this world. There's a lot of really incredible work in here that's well-worth taking the time to explore. impressively compelling and very comprehensive. The material oriented around The Last Unicorn itself is saved for the end, including a peek at IDW's comic adaptation, the publishing of the "lost" version of the book, selling strips from 35mm film prints to fans, and why so many decades passed before Beagle penned a sequel. 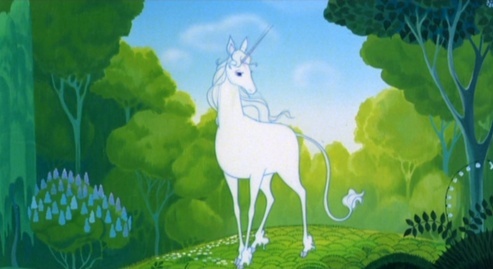 The Tail of The Last Unicorn (9 min. ; SD): Most of what's in this featurette has already been tackled in the other extras, making it one of the less critical ones to watch, but it's still a strong summary of the main talking points: the origins of The Last Unicorn, brief discussion about its themes of self and loneliness, the unexpected success of both the novel and its film adaptation, and the greatly appreciated adoration from its many devoted fans. Schmendrick's Magical Gallery: Following some detailed discussion about Beagle's parents and upbringing, viewers are given a chance to learn about some of the inspirations for The Last Unicorn, take a peek at covers of the book from one end of the globe to the other, and look at an extensive selection of photos and artwork. Trailer (3 min. ; SD): Last up is a standard-def theatrical trailer. The magic and imagination that define The Last Unicorn continue to entrance nearly three full decades after the film was first released in theaters. 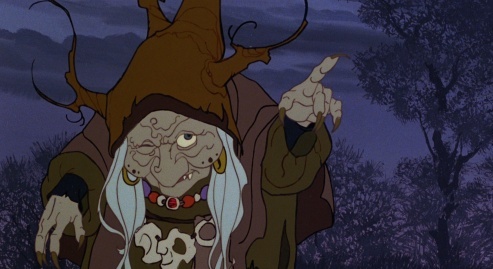 Even without the glossy sheen or colossal marketing budget of a Disney release, The Last Unicorn has managed to amass a very devoted fanbase, and I'm sure every last one of them will be thrilled to discover how incredible this lifelong favorite looks and sounds on Blu-ray. Unlike so many other catalog titles on Blu-ray which don't amount to much more than a higher resolution DVD, this disc is clearly a labor of love. The new transfer is breathtaking, the upgraded audio eclipses anything I could've hoped to hear, and there are a fair number of new extras compared to the 25th anniversary DVD from just a few short years back. All of the blood, sweat, and tears that went into producing this Blu-ray disc don't come at much of a premium either; almost every online retailer on the planet is carrying it for $15 or so. It's an absolutely essential purchase for longtime admirers of the film, and if you haven't yet discovered The Last Unicorn yourself, there's no better way to start than this. Very Highly Recommended.